Congratulations to all the players on the 2018 All-Metro Offensive Team. GOLDEN VALLEY, Minn. - Each year KARE 11's Randy Shaver selects the post-season All-Metro Prep Football team. This is the 32nd year of the team. 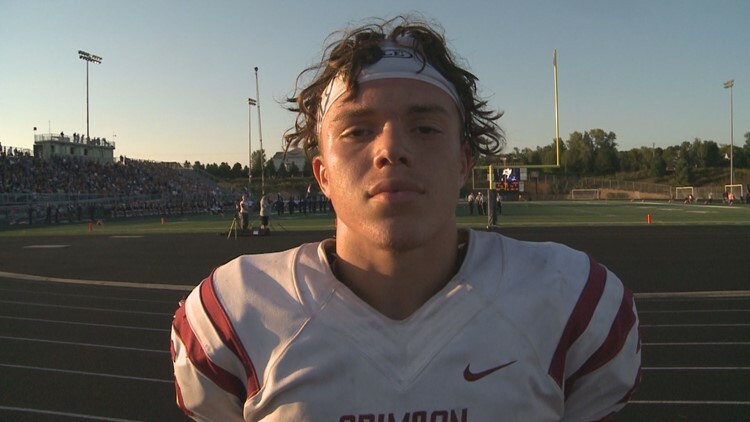 Our 2018 KARE 11 All-Metro Offense is led by star running back, Evan Hull of Maple Grove, a repeat All-Metro player. He was among the state's leaders in carries and rushing yards during the regular season. Hull finished his senior year with 1915 yards and 19 touchdowns. He totaled 4200 yards on the ground in two years at Maple Grove. BRENDAN MCFADDEN, St. Thomas Academy, Sr.
Our other All-Metro running back is Brendan McFadden for St. Thomas Academy. At 6 feet 1 inch, 210 pounds, McFadden has good size, deceptive speed and tremendous instincts. He's rushed for 1,497 yards and 35 touchdowns in limited action because of blow-out games. The Cadets are undefeated and playing in the State 5A semis. 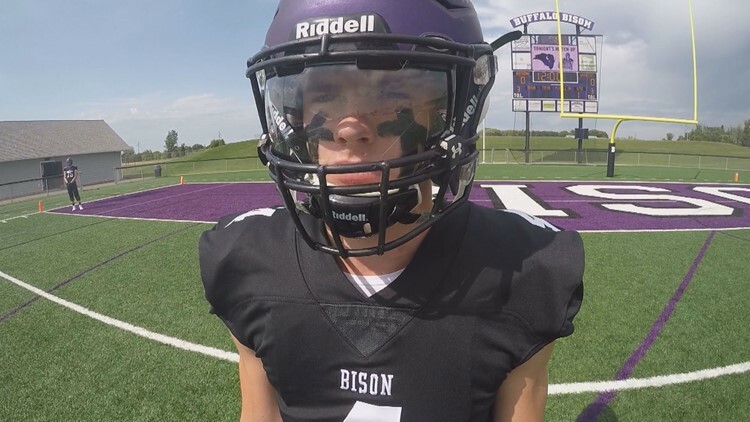 Our All Metro quarterbacks are led by Buffalo star Aidan Bouman at 6 feet 5 inches and 225 pounds. The junior led the state in passing yards, completions and touchdown passes during the regular season. Bouman has a big-time arm with pinpoint accuracy. 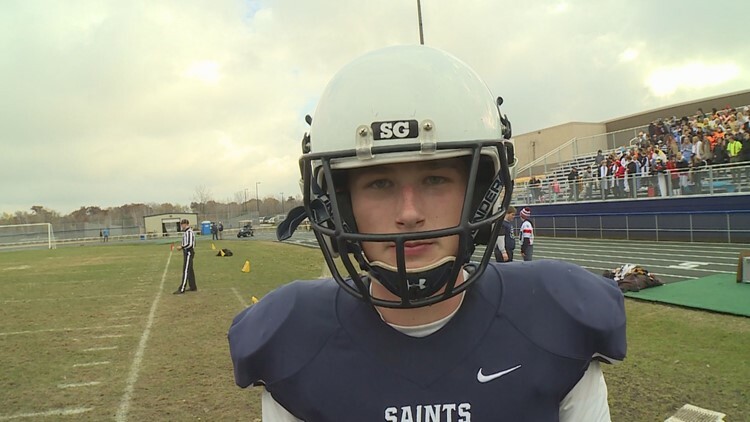 He finished the season with 3,474 passing yards and 41 touchdowns with just wis interceptions. He's verbally committed to Iowa State as a junior. COLE KRAMER, Eden Prairie, Sr.
Eden Prairie senior Cole Kramer is Gopher bound and he knows all about winning. Kramer is 6 feet 1 inch, 190 pounds, and he makes plays with both his arm and his legs. Kramer is described by opposing coaches as the ultimate competitor and field general. A three-year starter, Kramer's record is 33-2 as a starter. 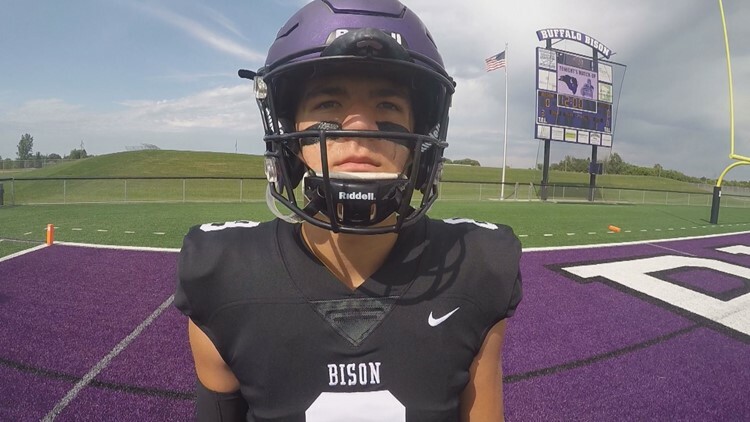 We have one All-Metro receiver, Buffalo star Treyton Welch. Welch is a big body receiver at 6 feet 4 inches, 210 pounds with deceptive speed. It's what made him so dangerous the past two seasons. He led the state in receiving yards during the regular season and finished with 1302 yards on 71 catches with 16 touchdowns. 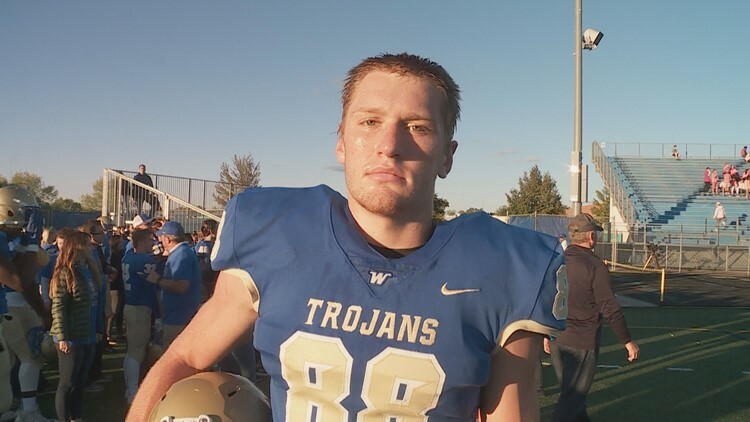 Our All Metro Tight End is Wayzata's big target Nick Kallerup. Kallerup moves well for a 6 feet 4 inch, 235-pound receiver. He filled in for the injured starter and played incredibly well, and opposing coaches called him a real force. Kallerup finished with 34 catches for 363 yards and 8 touchdowns. Quite the success story. 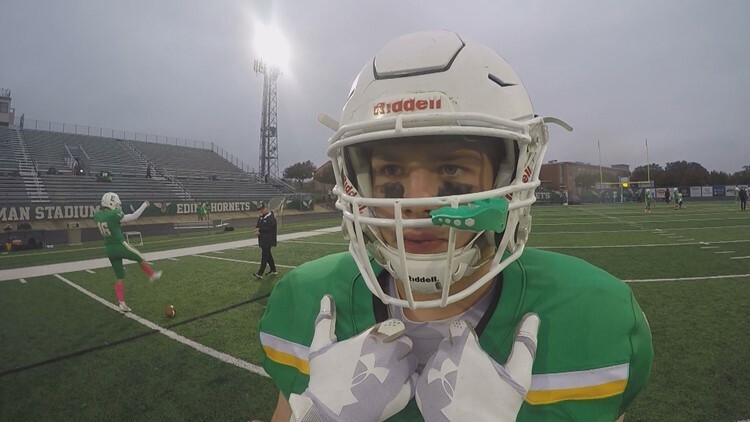 Our All Metro Athletes are led by Edina's Matt Cavanagh, a strong two way player. On defense, Cavanagh led Edina in tackles with 80. He added 2 interceptions. On offense, the Harvard commit also led the district in carries with 218. A true workhorse. He finished with 1345 yards rushing and 10 touchdowns. RAJA NELSON, Lakeville North, Jr.
Our other All-Metro athlete is Lakeville North junior Raja Nelson. He's only 5 feet 10 inches, 175 pounds, but great speed and tough when he needs to be. 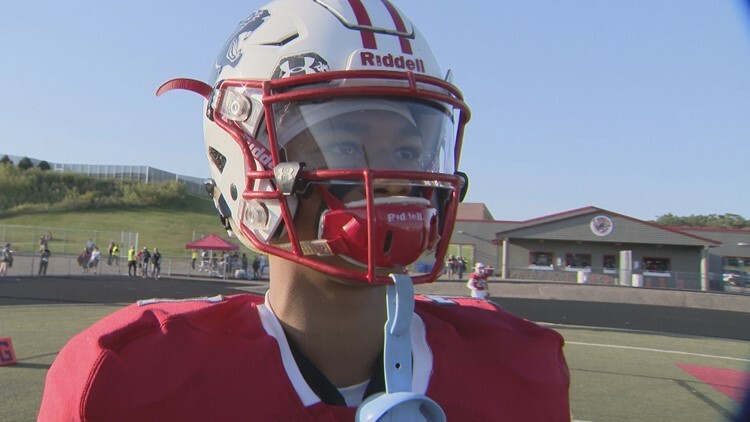 Nelson was named the Metro South Offensive Player of the Year. Nelson has scored 22 touchdowns. Lakeville North is undefeated and will play in the State 6A semifinals. 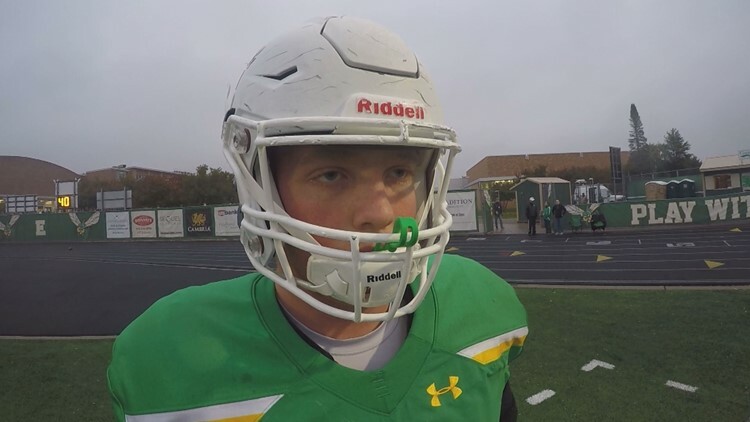 Our All Metro Offensive line is led by repeat KARE 11 All-Metro performer, Quinn Carroll of Edina. What sets him apart from others is his motor, he blocks to the whistle every play. Carroll was a four-year starter who never missed a game. He's a big-time player at 6 feet 7 inches, 295 pounds with excellent technique, strength and quickness. He did not give up a sack all season. Carroll is headed to Notre Dame on scholarship. 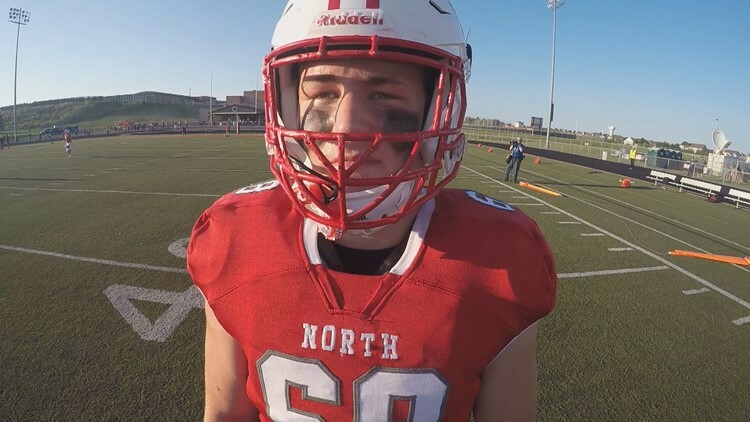 BRYCE BENHART, Lakeville North, Sr.
Lakeville North star tackle Bryce Benhart is massive at 6 feet 9 inches and 305 pounds. This guy is a monster player on the state's best 6A team. He recently committed to Nebraska. Benhart is strong, with great feet and uses his leverage to beat his opponent. 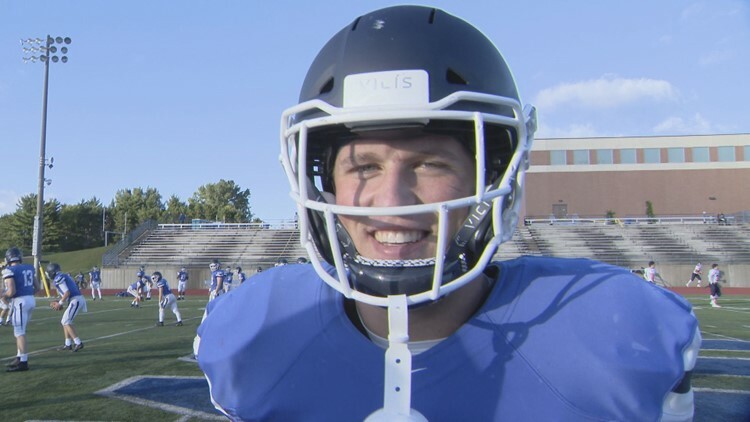 He's a repeat KARE 11 All-Metro performer. 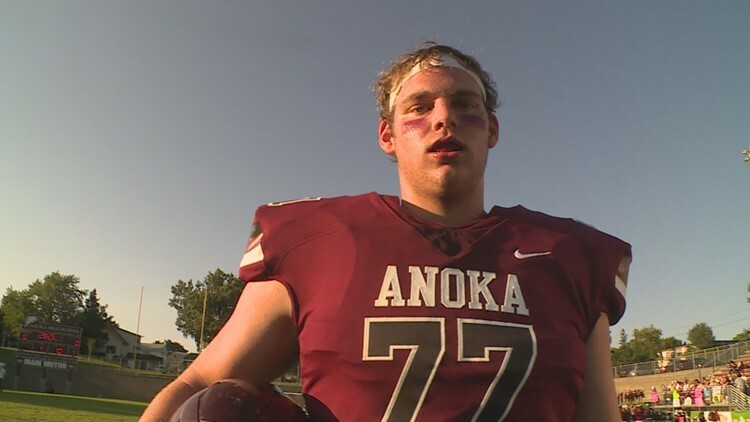 Anoka tackle Joey Lombard is a very large man at 6 feet 5 inches and 310 pounds. Lombard is relentless. He blocks to the whistle. He is big, strong and has a mean streak that allows him to punish opponents. The three-year starter is headed to South Dakota on scholarship. 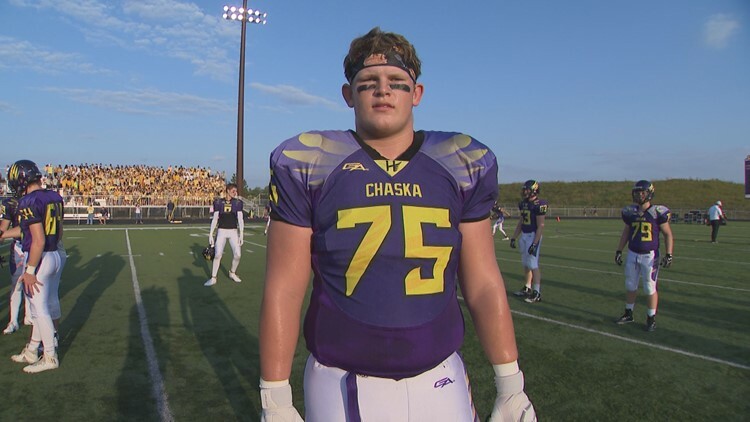 Chaska tackle Ethan Jackman had a fabulous season for the Hawks. He's 6 feet 5 inches and 285 pounds. He’s tough, strong with solid technique. He was named the Suburban White offensive lineman of the year. Jackman led the Hawks to the 5A State quarterfinals. He will play Division I college football at Air Force. Cambridge-Isanti tackle Brandon Westberg is 6 feet 5 inches and 285 pounds. He's the first four-year starter at Cambridge since 1965. Westberg recorded a school record 93 pancake blocks this fall. 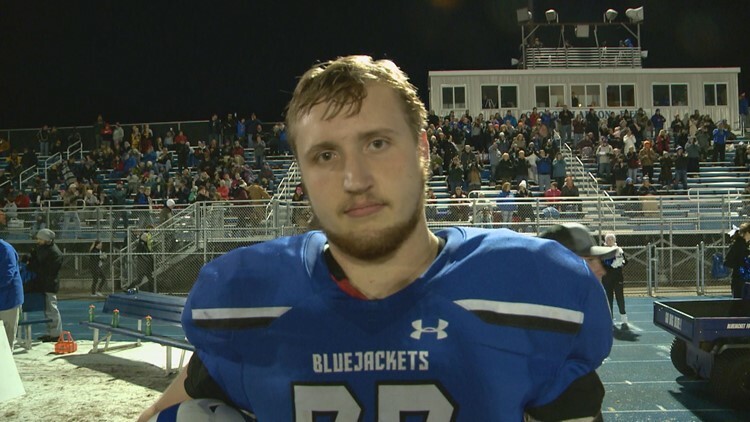 He was voted the Offensive lineman of the year in the North Central Blue district. He's headed to North Dakota State on scholarship. 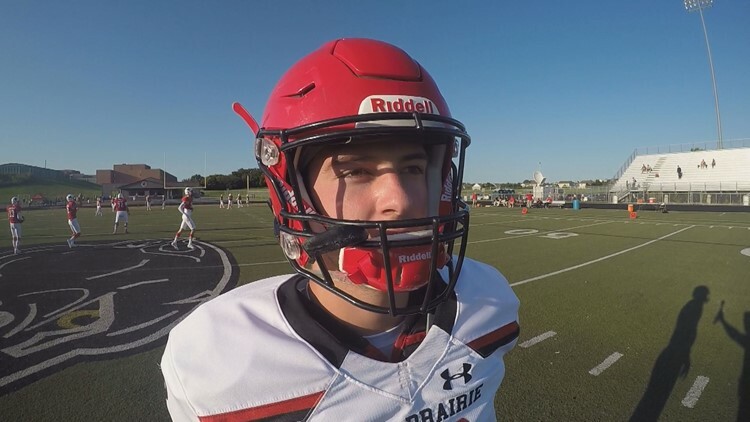 HUNTER DUSTMAN, St. Francis, Jr.
Our All-Metro Kicker/Punter is St. Francis junior Hunter Dustman. Dustman isn't your average kicker at 6 feet 3 inches and 200 pounds. He made 7-of-10 field goals, the longest from 42 yards. But as a punter? Wow. He nailed one punt for 67 yards. He averaged 40 yards per punt. Just a booming leg and he'll be back next fall. 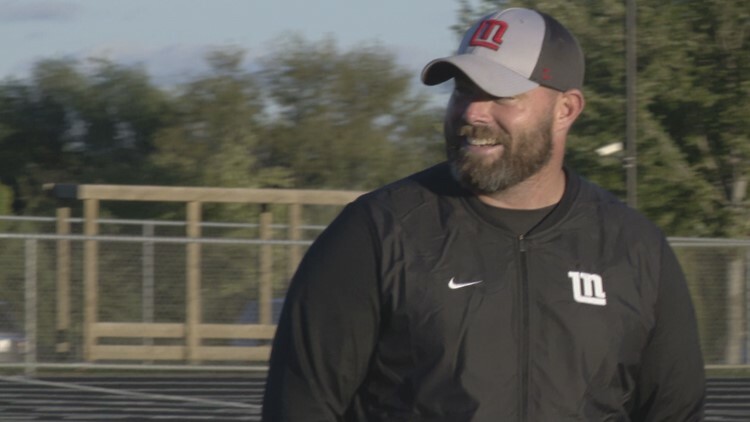 And we have co-Coaches of the Year, the first is Brian Vossen of Lakeville North. The Panthers are undefeated heading into the State 6A semifinals, ranked #1 most of the season. Under Brian’s leadership, Lakeville North shutout perennial power Eden Prairie and beat other top-10 6A teams. The Lakeville grad has an 81-19 record in nine years. 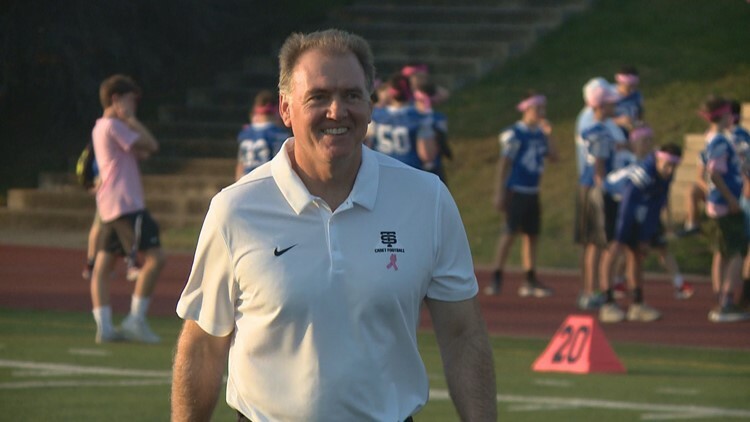 And our other Coach of the year is Dan O'Brien of undefeated St Thomas Academy. His athletic director says, Dan has established a culture amongs his players that celebrates hard work, humbleness, and appreciation. That says a lot. St Thomas Academy has outscored opponents 449-to-59. Congratulations to Dan O'Brien and Brian Vossen, our co-head coaches of the year!